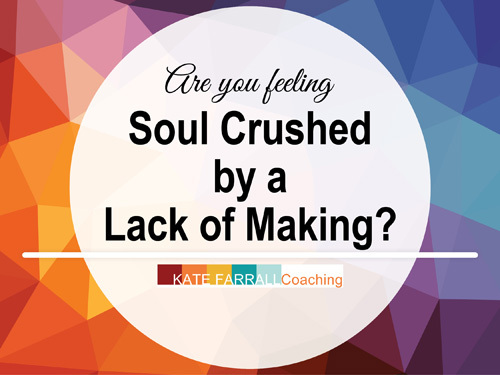 Are you Feeling Soul Crushed by a Lack of Making? Maybe you’ve got kids. Maybe you’ve got a job that is so exhausting that when you get home, all you want to do is stuff a burrito into your gullet and zone out to the latest episode of your favorite Netflix show. Life brings us through twists and turns and sometimes we realized that we’re not making art, we’re not being creative at all. How did we get here? I bet you can remember a time when you could feel how all the planets had aligned and you could spend hours deep in the creative flow of your work, un-disturbed. ….Ahhhhh, those times were good. But, if life has changed since then, getting lost for hours on a whim in the making zone is no longer an option. You just don’t have a schedule that works that way right now. Do you feel soul-crushed by this lack of making? If so, how do you work it into your everyday life again? I’ve got one big solution for you. It may not be popular because artists are notoriously not into doing this (myself included). I think you’ll be surprised by how easy it is. Pick up your smart phone. Add 10 minutes each day to do small, LOW COMMITMENT making. Keep it tiny, not overwhelming. Be ready to throw it away: these are experiences, not keepers. This is not about creating a masterpiece. This is not about sharing it all over social media. This IS about you scratching out 10 minutes a day to start getting your mind thinking creatively again. If you’ve not been making very consistently, you need to re-engage that side of your brain. It may hurt for the first week as you break off the slag to get to the good stuff which is a-okay. It’s to be expected as you get your art mojo back! Keep a post-it pad next to where ever you eat breakfast and while you sip tea or coffee, put your pen to the paper. Even if you’re not a morning person. Have kids or a partner who are distracting for those 10 minutes? Explain that you need their support to draw for 10 minutes. Give them their own pad of paper and ask them to join you. Awesome. So, I’ll pose the idea in a different way… How can you spend 10 minutes a day, or even every other day, being creative in a way that works for you? Maybe it’s list-making, maybe it’s playing with water colors, maybe it’s taking one photo where you tried to make it something you liked. Maybe you do this during lunch sitting in your car outside of your office or on a park bench? Or do it during dinner? Pairing this time with something that you do everyday helps you remember to do it and it helps to make sure the time is already carved out in your schedule. If you can do this while you brush your teeth, I’m all for it (and I’d say you’re seriously talented). Working a creative process into your daily routine will help you to stop obsessing over how you got HERE, in a world so far from the one you loved where you could make and be creative all the time. You’ll feel like you’ve been productive in a way that you have control over, in a way that you’ve chosen to spend your time. Give it a try and let me know how it goes. 10 minutes a day. Where can you squeeze yours in? – Let me know in the comments. Here’s to creating habits to keep the creative side of you alive! Posted on September 8, 2017 by Kate Farrall.